Acoustic shock is an injury caused to telephone headset users by exposure to abrupt and unexpected high pitched tones (HPT), 'shrieks' or other noises (loud or soft) that may occur in telephone networks. Another cause of acoustic injury can be using telephone headsets where you are constantly listening to your callers at a loud level. This level is known as your average listening level. This injury is not just linked to faulty equipment. It is not limited to any particular telephone or headset type, or any particular telecommunications network or equipment. High pitched tones are random and often cannot be traced or prevented from recurring. The injury is a result of strong muscle contraction in the middle ear after exposure. Acoustic shock has become more common with the increase in telephone traffic and the growing number of call centres with dedicated operators. Headsets exacerbate the problem as they take longer to remove than handsets. Noisy Environment? Think twice before increasing the volume. The louder the volume, the louder the sound spikes that can occur. Using a PC headset with a soft phone? Most PC headsets lack any volume limiting or acoustic shock protection. Ever visited a website with loud audio, or knocked your volume controls? A computer sound card can easily output a sound level that can induce temporary or permanent hearing damage. It's not just a call centre issue. Stress and anxiety can heighten the effects of acoustic shock. One incident may lead to a feeling of apprehension about the likelihood of a recurring incident, even at a lower noise level. Likewise, a user's anxiety is further increased if volume levels must be turned up where the ambient noise level in the call centre is quite high. Acoustic shock is not an imaginary or malingering issue but a psychological shock response. Call center workers are at increased risk. Suffers of acoustic shock are hypersensitive to loud sounds and exhibit a fear of reoccurence. It's even likely to effect co-workers. 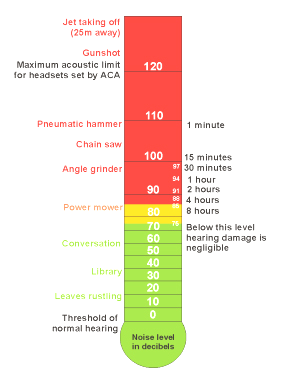 How much noise can cause permanent hearing damage? 130dB is equivalent to the noise level of a jet engine! Devices to protect your hearing when wearing a telephone headset are not new. Many quality headset amplifiers provide some degree of protection from excessively loud sounds. However, they do NOT comply with OH&S standards in most countries. The Australian standards can be found here. Some smaller players have sourced/developed their own models. However, please be sure that they comply with the latest OH&S standards set in your country.